Come visit Buttonwood for a marriage mistake like no other in the third novel of Kelly Eileen Hake’s Prairie Promises series. 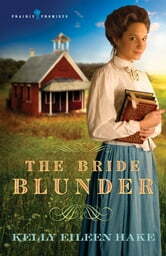 In the Nebraskan Territory of 1859, Gavin Miller writes home to request the hand of Miss Marguerite Chandler. Unfortunately, while he never forgot Marguerite was the French word for Daisy, he’d failed to recall that the two cousins shared their grandmother’s name, and Marge was the nickname of the wrong Miss Marguerite Chandler! When his surprise bride comes to Buttonwood, unexpectedly followed by the very cousin he’d meant to marry, will Gavin be able to solve The Bride Blunder?